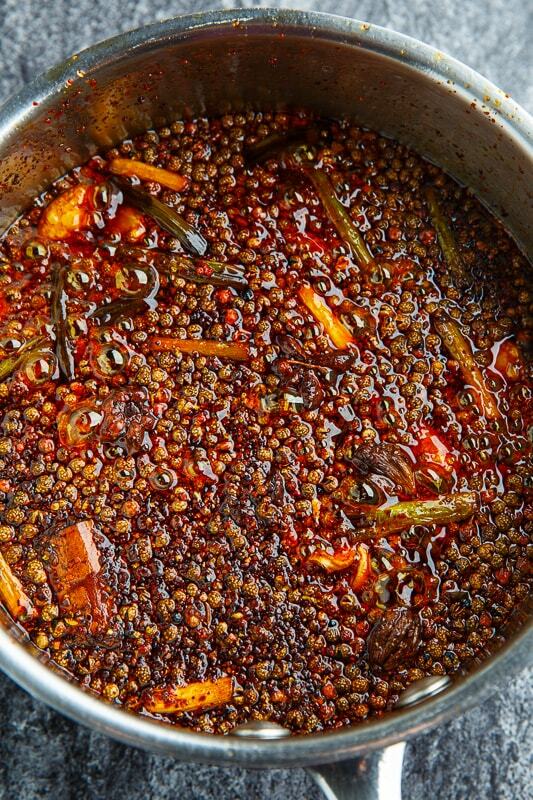 Spicy and aromatic chili oil with mouth numbing sichuan peppercorns that is a great way to add some chili heat to any dish! 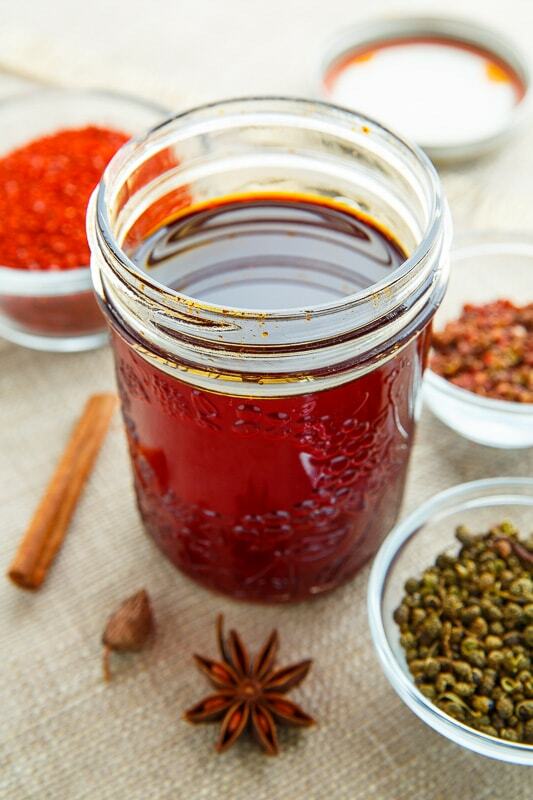 Chili oil is a common ingredient in Asian cuisines and it’s super easy to make your own! At it’s base chili oil is oil and chili pepper flakes! You simply heat the oil, add the chili pepper flakes and let cool/sit so that the chili pepper heat is infused into the oil! You can add extra flavours to the chili oil making it more complex with common additions being garlic and ginger. This is a Sichuan chili oil because of the use of Sichuan peppercorns which add a nice lemony aroma along with creating a slight tingly numbness in the mouth which goes perfectly with the spicy heat of the chili peppers. Sichuan peppercorns come in green and red and you can typically find the in an Asian/Chinese grocery store, though they are usually labeled poorly so you have to look at what’s in the package to make sure you are getting the right thing. 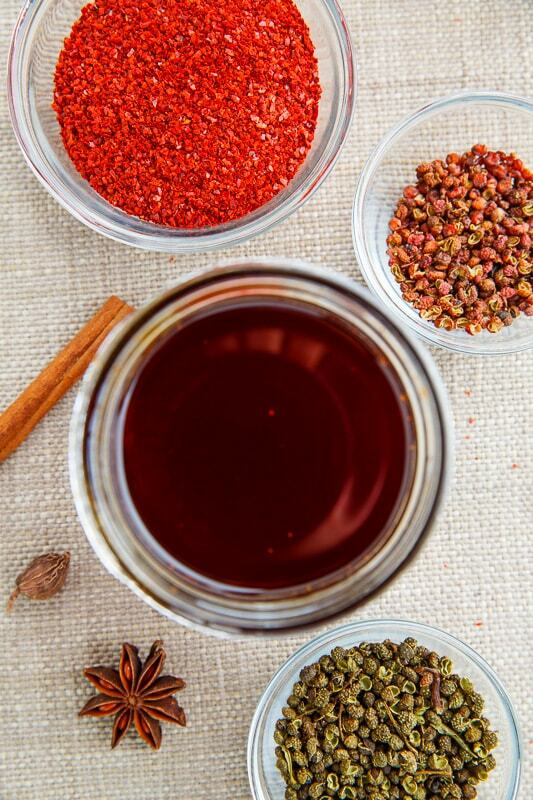 This Sichuan chili oil is spiced with hints of cinnamon, star anise and black cardamom and I tend to use Korean style chili pepper flakes as they are easy to come by. (I use the same chili pepper flakes in my homemade kimchi.) Once made, this chili oil will last for months in a sealed container in the fridge. 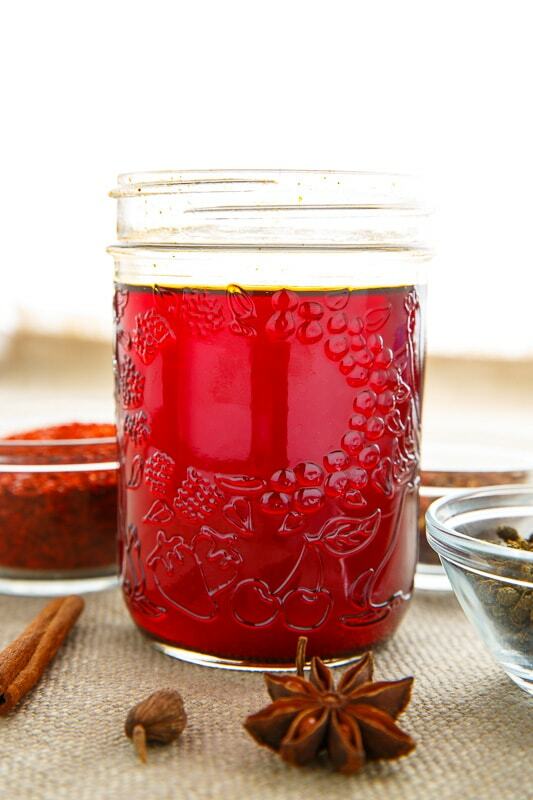 Use proper canning procedures to keep longer at room temperature! Such a beautiful red colour! Heat the oil over medium-high heat to about 350F/180C, the tip of a wooden spoon or a wooden chopstick will start to bubble around the edges when it is hot enough, before removing from heat. Add the ingredients and let sit until the bubbling stops before covering and letting it cool completely, or overnight. Strain the solids and store in a a sealed container in the fridge. What kind of oil do you recommend using? Yes, what kind of oil? Canola? Grapeseed? Hi. Love the look of this recipe and would really enjoy giving it a go. One quick question, what does ‘until the scallion white becomes white’ mean? It’s already white! Clarification would be appreciated. Thanks in advance. Anonymous & lauriebarrera: I use vegetable oil and peanut oil should also work. Enjoy! The recipe says vegetable oil so I assume it means vegetable oil. 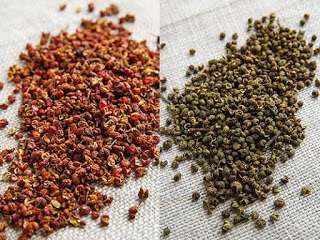 can you use just one color of sichuan peppercorns, either all red or all green? Lacey: Yes you can! The green ones are more potent so if you are using all green replace the red with 1/2 the amount of green and use more red in place of the green. Enjoy!